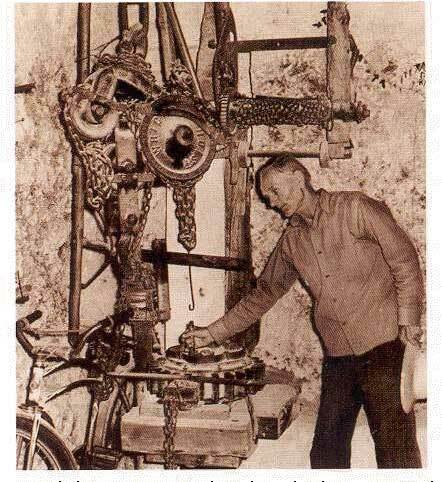 Edward Leedskalnin and his "Big Secret"
Most of you know about Ed Leedskalnin - he was the builder of the Coral Castle or as he called it - Rock Gate City. If you don't know about this great man, you can read his book "Magnetic Currents" in it's entirety in my book "Electricity - Make it, Don't Buy it" available at www.electricitybook.com. I was visiting a web site the other day where a guy named Jon Depew claimed he had figured out Edward Leedskalnin's secret. The web site is coralcastlecode.com (currently not working Oct 2011). It's very interesting reading, and I encourage you to visit and check it out for yourself. Since I wrote this newsletter, he has added some very interesting videos and some information and videos about something he calls "Equilibrius" - which looks like a matrix of spinning magnetic tops. He also "discovered" that the magnetic currents from Ed's generator rotate in a vortex like motion. Of course, Ed Leedskalnin was keenly aware of this and mentions it often in his writings. While reading Jon's web page, something "clicked" in my brain and it all started to make sense to me. Now would be a good time to warn everyone... I am not an electrical or mechanical engineer. What I am about to describe to you may be totally wrong. My only claim to fame is a whole lot of "horse sense". But that's how most great inventors come up with their ideas - by just observing the forces of nature and then applying a little bit of common sense. Ed Leedskalnin, Nikola Tesla, Victor Shauberger, Newton, Faraday, and many others all did this. Feel free to let me know if you disagree with my "theory" - there's a good chance I might be wrong. My contact information can be found on the www.electricitybook.com web site. Before I get into my little discovery, let me tell you about another web page that I ran across while investigating my theory. This man, W.T. Wellington, is moving around and building stuff with 10,000 ton blocks of cement all by himself! He uses simple fulcrums and counter weights to do it. It's absolutely amazing. 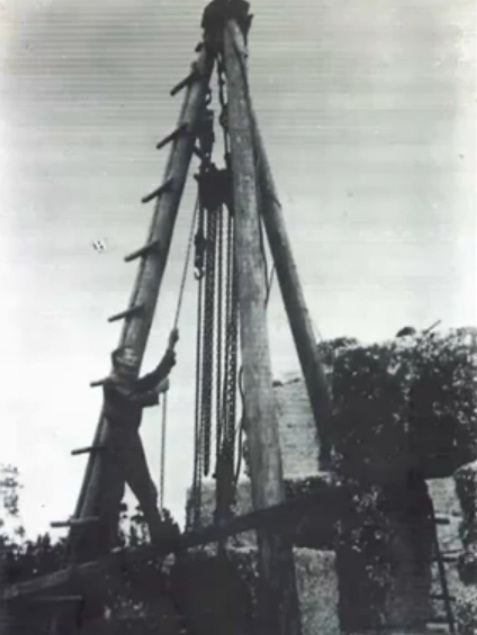 He claims it is how they built the pyramids, Stonehenge, and how Edward Leedskalnin built the Coral Castle. A lot of people think Ed had some kind of anti-gravity device or something crazy like that - nothing could be further from the truth. There's even pictures of Ed with giant tripods and multiple pulley systems with strong chains. That does not look like anti-gravity to me! Anyway... all those claims are dispelled at W.T. Wellington's web site. "An induced electromotive force generates a current that induces a counter magnetic field that opposes the magnetic field generating the current." So... as the rotor in a generator approaches the magnetic field of the stator, a current is produced in the wire of the rotor. That's your generated electricity. 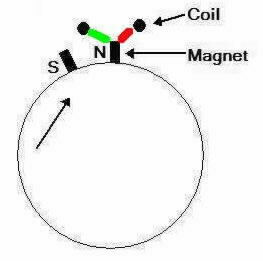 But... the rotor current also produces a magnetic field that opposes the magnetic field of the stator. As you all know, likes repel and opposites attract. So... as the rotor approaches the stator, a repelling force is created that retards the rotational movement of the rotor shaft. Then, as it passes the stator, there is still a repelling force that gives the rotor a "kick" in the right direction adding to the rotational movement. But this is terribly inefficient. 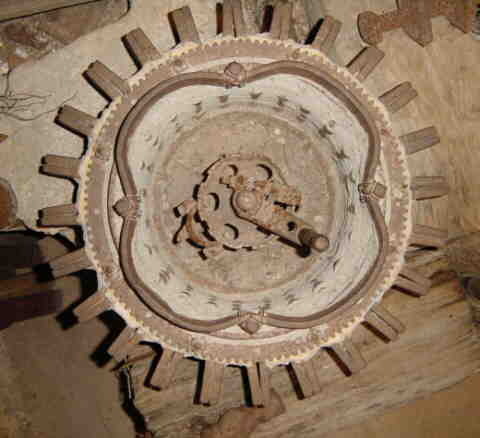 What modern generators are doing is stopping and then restarting the rotational movement of the rotor shaft. This is way out of line with the laws of harmonics (shame on you Nikola! Tesla had many different patents on dynamos and AC generators - I'll have to check to see if any of his patents work like Ed's generator). "An object in motion will stay in motion and an object at rest will stay at rest unless acted on by an unbalanced force." So... putting the brakes on the rotation of the shaft goes against Newton's law. And then... the repelling action (after passing the stator) which tends to add to the rotation goes against Newton's law too because "an object at rest tends to stay at rest". Now you see why it really does take two horsepower per kilowatt to rotate a generator shaft! Now take a look at my crude drawing of Ed Leedskalnin's generator. The GREEN represents a repelling magnetic force that adds to the clockwise rotation and the RED represents a repelling magnetic force that retards the clockwise rotation. Of course, there are similar attracting magnetic forces not shown. The important thing to take note of is that the magnetic forces are always in balance and basically cancel each other out. Also note that Ed's rotor is a heavy "flywheel" and flywheels are a harmonic device just like a child on a swing... once you get it going, it is very easy to keep it going. Anybody who has ever operated a pottery wheel knows this to be true. So there you have it. That's my theory in a nutshell. And don't forget this little piece of information... notice that there can be up to 24 stator coils on Ed's generator. So... with the same rotation, you get 24 separate generators - not just one as in a regular generator. Also... it is low rpm. In my book, I stated that it would have to turn at 300 rpm to get 60Hz. That's good for applications like wind power where you don't get a whole lot of rpm's. Modern 2 pole generators have to be run at 3600 rpm and 4 pole generators have to run at 1800 rpm to get 60Hz. This is the kind of great information you get in my book "Electricity - Make it, Don't Buy it". So if you do not have a copy yet, go to www.electricitybook.com right now and get yourself a copy. You can download the eBook immediately after payment. "Now about the generator. In the first place all currents are alternating. To get direct currents we have to use a commutator. Transformers and generators of any description are making the currents in the same way by filling the coil's iron core with magnets and letting the iron core push them out and into the coil. Connect the battery with the electric magnet. It will be a field magnet now. Put the three-inch coil between the iron prongs and take it out, do it fast, repeat it, then you will have a steady light in the light bulb. Now you and the field magnet are a generator. Suppose you had a wheel and many coils around the wheel turning, then you would be making all kinds of light." Now... the Coral Castle is no longer a Mystery!